NASA's Spitzer Space Telescope has recently mapped the surface temperatures of a "super-Earth," giving us a rare glimpse into the environmental and weather conditions on a distant extrasolar planet. The exoplanet in question is called "55 Cancri e"— one of five exoplanets discovered orbiting the star 55 Cancri, about 40 light years away in the constellation Cancer. Of the five, "e" is the smallest — though still weighs in at about 8 times the mass of the Earth, and twice the diameter. 55 Cancri e is about 25 times closer to its star than Mercury is to our sun. At this tight distance it takes less than 18 hours to revolve once around its star — so, 55 Cancri e's year is shorter than a day on Earth! Since the planet is so close to its star, its rotation is most likely "locked" by gravitational tidal forces, so that the same side always faces the star — not unlike how the Moon is tidally locked to the Earth, always presenting the same face to us. 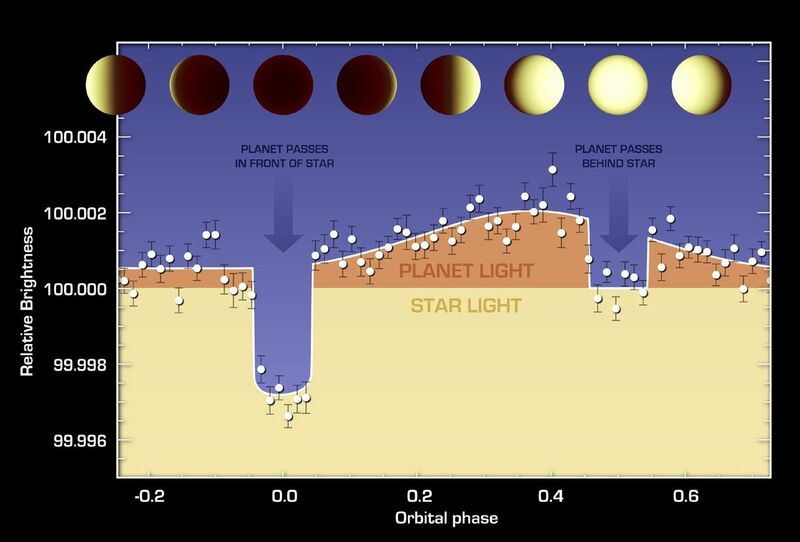 Spitzer made observations of the super-Earth over several revolutions, which has allowed it to map heat variations over the entire surface (night side and day side) multiple times. 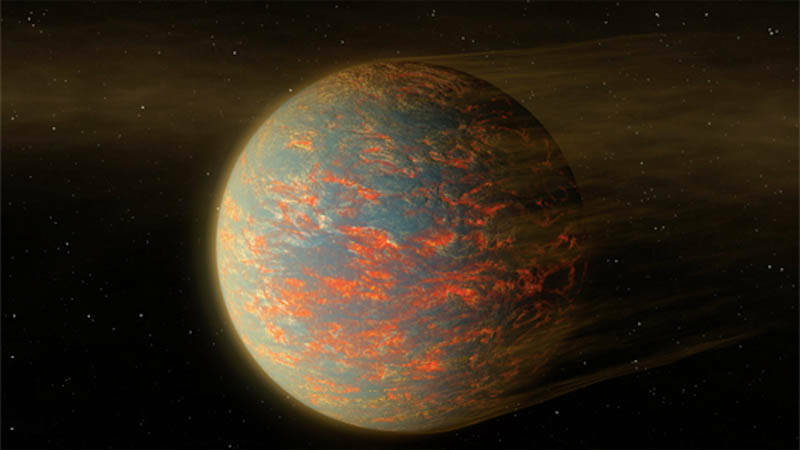 This map has revealed some remarkable things about 55 Cancri e.
For one, the permanently day-lit side of the planet has a peak temperature of about 4,400 degrees Fahrenheit — hot enough to melt lead, iron, silicon and many other substances. By contrast, temperatures on the hemisphere of never-ending night drop sharply to lows of only 2,060 degrees Fahrenheit — not exactly chilly, but low enough for lava to "freeze" into solid rock. The huge difference in temperature between the day and night sides of 55 Cancri e tells us that the planet does not have an atmosphere capable of spreading heat evenly around the globe — which could mean little or no atmosphere, or an atmosphere that isn't great at globally transporting heat. By contrast, Venus possesses a super-thick atmosphere of carbon dioxide gas, which spreads heat with great efficiency to give Venus about the same (hot) temperature across its entire surface — day side, night side, equatorial zone and polar regions alike. The Spitzer heat map also tells us that the day-side surface is likely to be inundated with rivers and large pools of molten lava — lava that under the extreme temperatures may behave in a "super-fluid" state, flowing more like the water in Earth's oceans than the sluggish toothpaste crawl of much cooler Earthly lavas. 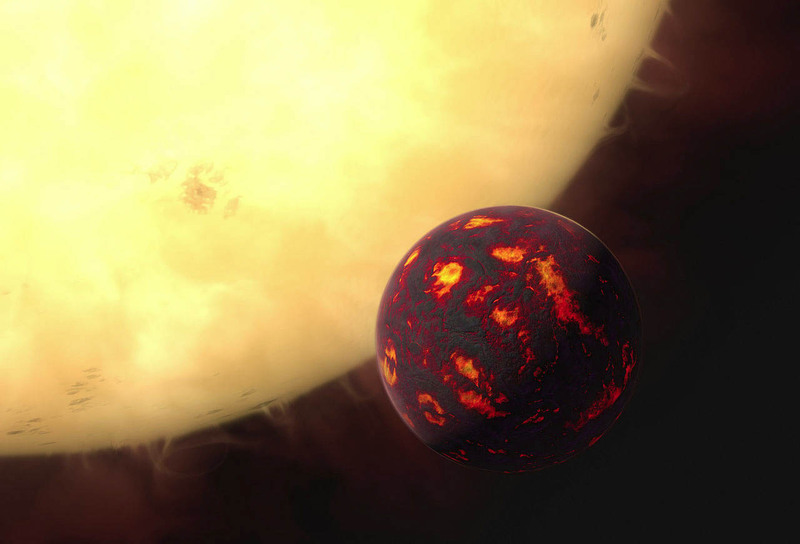 On the flip-side of the planet, where it is "chilly" enough for lava to solidify, we can envision a hot, dark landscape of solid lava rock—maybe under a brilliant starry sky, depending on the nature of any atmosphere 55 Cancri e may possess. We may also imagine a twilight zone between the two extreme hemispheres. Could we find landscape forms of solid rock and liquid lava, maybe a super-Earth, super-heated version of Norway's fjords? Whatever the case, 55 Cancri e is definitely an imagination-teaser! Further investigation by NASA's up and coming James Webb Space Telescope, which will be larger than Hubble or Spitzer and make observations at infrared wavelengths, will reveal even more about this, and other, fascinating extrasolar worlds.